Two winners shared £50,000 of prize money for their work raising public awareness of ongoing testing. For their high-profile campaigns against organisations that test on animals and that provide support services for animal testing. Accepted by: Justin Goodman, Laboratory Investigations Department (LID) director. 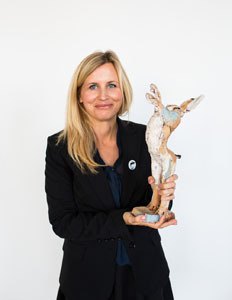 For publicising the use of animal-testing in national drugs regulation and helping consumers to buy cruelty-free products. For their cross-platform documentary illuminating the lives of individual animals living within and rescued from the machine of our modern world. For their innovative and memorable campaigns encouraging people to think about, and then re-think, animal testing. For their multi-pronged campaigns for animal-free testing, which have helped to achieve international legislative change. For their eye-catching popular campaigning which helped bring about a ban on cosmetic testing on animals in India. For the rescue of 2700 beagles from a major European company breeding animals for vivisection. For his multi-platform and international campaigning against animal testing. For their high-profile work rescuing beagles from laboratories in the US and Europe. For their campaign to end the use of chimpanzees in US research and release them to sanctuary.